TIGERLIM.COM: Don't Say I Didn't Tell You Oh!!! 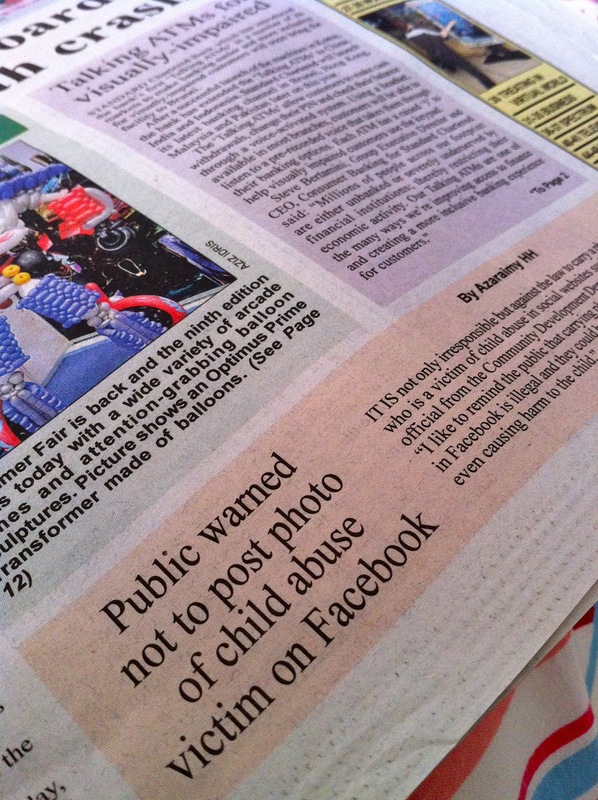 From Borneo Bulletin 4th January 2012 | "Bandar Seri Begawan - It is not only irresponsible but against the law to carry a photo of a minor who is a victim of child abuse in social websites such as Facebook, an official from the Community Development Department (JAPEM) said. 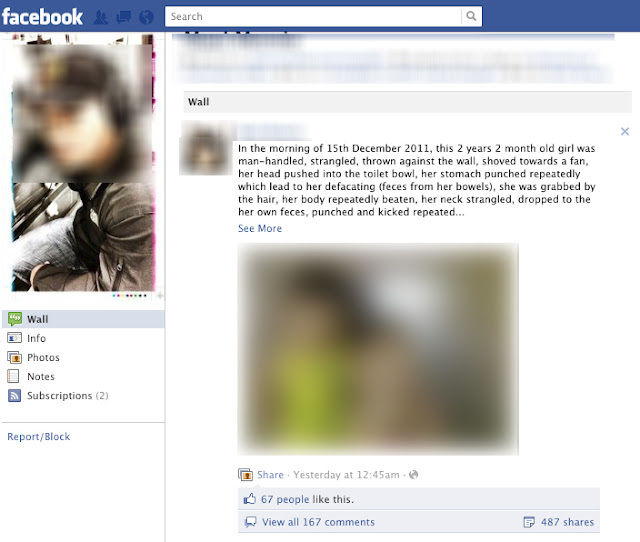 "I like to remind the public that carrying photos of a child abuse victim in Facebook is illegal and they could be prosecuted for disrespecting or even causing harm to the child." JAPEM said it was horrified to see some members of the public had linked the photo of the child abuse victim on a website for all to see. Under Section 95 (1) of Brunei's laws, no person shall publish or cause to be published any material which (a) reveals the name, address, or school, or (b) includes any particulars which may lead to the identification of any child or young person concerned in any proceedings in any court, either, as being the person by or against, or in respect of whom the proceedings are taken, or as being a witness therein except in so far as may be permitted by the court. conviction to imprisonment for a term not exceeding two years, a fine not exceeding $5,000 or both." For those who share it better take it down... Don't say I don't mention oh... if want to check who share in before very easily one.. just click see who got share before all your face semua come out liao. All together got 487 times sharing!! !